Well, it certainly has been a while since my last post…it’s approaching a year now. There’s a plethora of reasons I could come up with: it was just way too cold in the shop this past winter (it barely broke 35F in the shop all winter), there’s the kids (lots of work there), the P90X3 challenge (90 consecutive days of intense exercise), and a much needed hiatus (needed the time to re-focus). However, even though: it was frigid, and I didn’t have much time (P90X3/kids/hiatus), I did manage to get a couple of small projects completed so far this year. 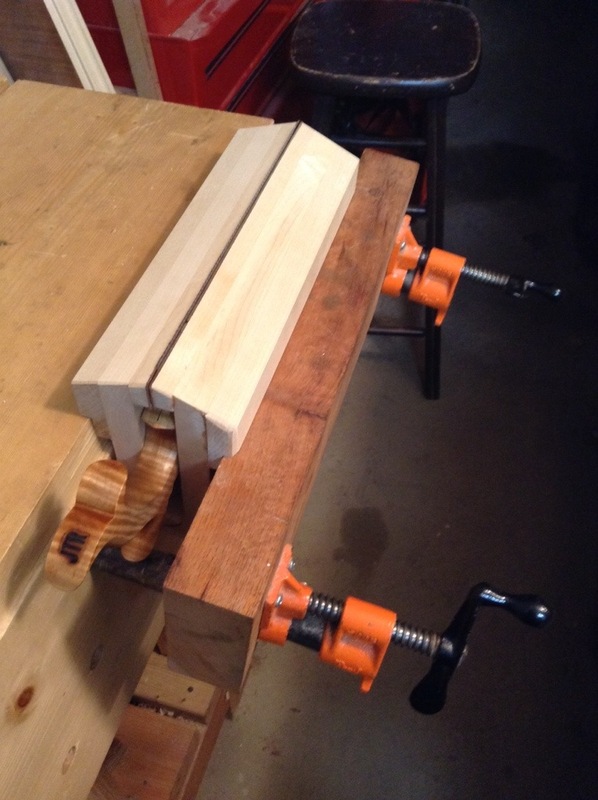 One of the first things I set out to do this year was build myself a saw sharpening vise. I based the design off the one that I believe Lie-Nielsen uses/created.The concept is basically two pieces of wood hinged together that clamp the saw blade in place. I just drop it into my moxon-like vise, which provides all the clamping pressure I need to hold the saw plate steady. 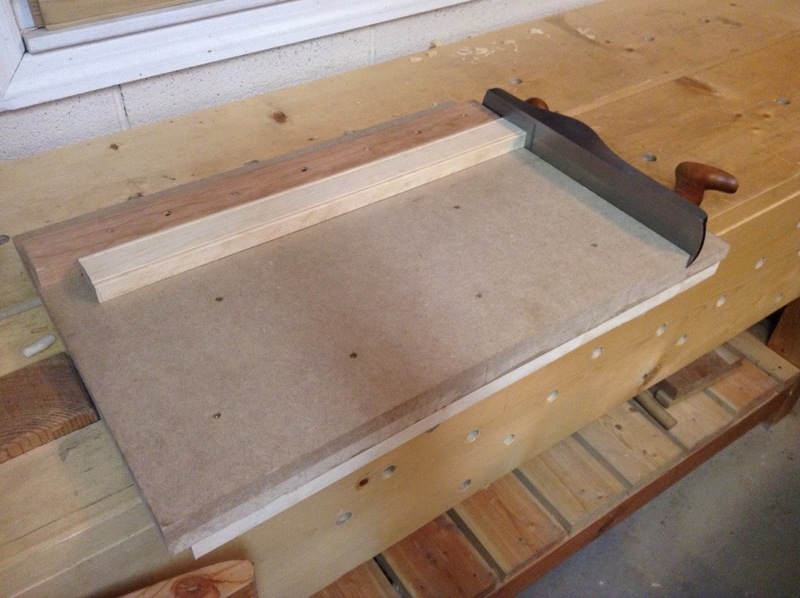 To help with the holding power, I glued a couple of strips of leather to the inside faces of the saw vise. Not bad for some extra scraps taking up space in the shop. I also made this shooting board from scraps around the shop. The base is made out of MDF and the rest are scraps of cherry and maple. I’ve been meaning to make this one for a while. I should get a lot of use out of it. Again…here are some more scraps. I had these nice strips of cherry left over from the Chiffonier project. It is not eveident in this photo, but there are strips of walnut sandwhiched in-between the strips of cherry. The walnut strips were strategically placed according to the tools you see in the photo (ie. 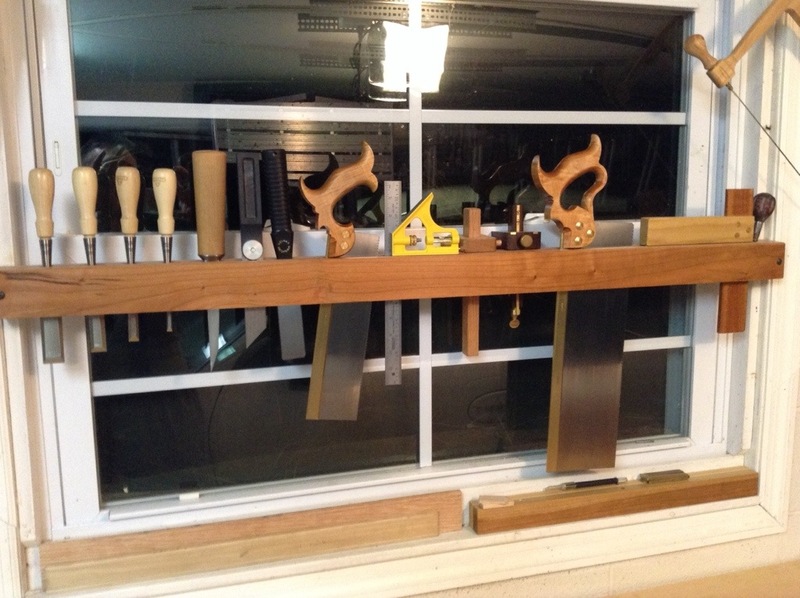 each chisel has it’s own home). The walnut creates a gap large enough for the small end of the tool to pass through rack. This helps keep my bench neat & clean, and in addition, positions the tools I use most at close range. I did manage to get one non-shop project finished. 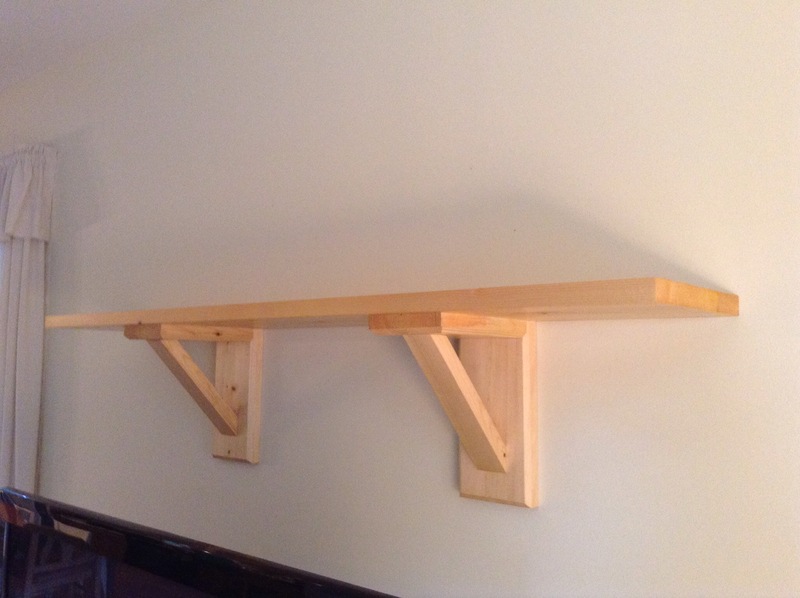 This shelf is made out of some type of pine. It’s held together with cut nails and glue. There is no fancy joinery – dados, rebates, dovetails, nor mortise & tenon – just the nails. A few chamfers and some shellace & wax and it was ready for it’s new home. This entry was posted in hand tools, VCF, woodworking, workbench and tagged hand tools, sharpening, woodworking, workbench by villagecustomfurniture. Bookmark the permalink.